Preheat the oven to 180°C/gas mark 4. Grease a non-stick muffin tin with oil. Cut the potatoes into slices about 2mm thick. Make sure the potato slices are all the same diameter so that the stacks don't collapse later on. In a small pan, melt the butter with the garlic for 2 minutes to infuse the butter but without colouring the garlic. Remove from the heat and stir in the cream and some salt and pepper. Set aside. 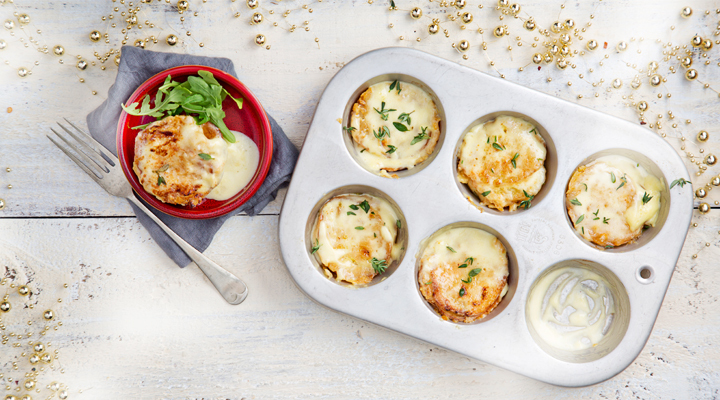 Put a potato slice in the base of each greased muffin tin cup, then add a little grated Cheddar cheese and a tiny pinch of thyme on top. Repeat to create two more layers, finishing with a potato slice. Pour the cream and garlic mixture equally between the stacks, then cover the tin loosely with foil. Bake in the oven for 30 to 35 minutes, then remove the foil and sprinkle the Parmesan and any remaining thyme over the top of the stacks. Put back in the oven and continue baking for 10 to 15 minutes more, until golden brown. Remove from the oven and allow to stand for 5 minutes, covered again loosely with foil, before lifting the potato stacks out of the tin. Serve immediately.